Openers Danushka Gunathilaka and Dimuth Karunaratne helped Sri Lanka reach 93 for no loss at lunch on day one of the second Test against South Africa in Colombo on Friday. Gunathilaka, on 44, and Karunaratne, on 42, were at the crease after the hosts elected to bat first in their bid to clinch the two-match series. Sri Lanka, who won the opening game in Galle last week, are eyeing their first series win against the number-two ranked Proteas since 2006. 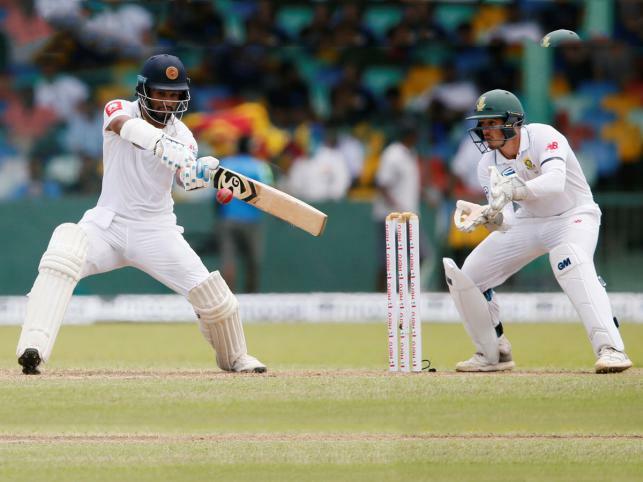 Gunathilaka and Karunaratne mixed the right dose of caution and aggression to keep the South African bowling attack at sea on a pitch that promises to offer considerable turn as the match progresses. Paceman Dale Steyn will probably have to wait for another session to get past former teammate Shaun Pollock to become the country's leading wicket taker in Tests. He is tied with Pollock's 421 wickets. South Africa's only regular spinner in the XI, Keshav Maharaj also failed to break through the defences of the two left-handed openers at the Sinhalese Sports Club ground. South Africa are without a second specialist spinner for this match, choosing to bolster their batting by bringing in 25-year-old Theunis de Bruyn, in place of left-arm wrist spinner Tabraiz Shamsi, who had played in Galle. Sri Lanka decided to go with three frontline spinners in their XI, though they did exchange the left-arm wrist spin of Lakshan Sandakan for the offspin of Akila Dananjaya. The hosts are without regular captain Dinesh Chandimal, who is suspended for the series due to a breach of the spirit of cricket.